Years ago, I taught Herman Hesse’s Siddhartha to my high school seniors. We spent a great deal of time reviewing the tenets of Buddhism but the concept that fascinated them the most was that of “karma”. This concept is colloquially understood to mean “what goes around comes around”. Buddhist philosophers have much more to say on the subject (as you might imagine) but the basic philosophy is this: if you emanate goodness, you will receive it in return. And, just in case you were wondering, the opposite is also true. I’d like to believe in karma. I try to be a good person without the expectation of getting anything in return but the thought of potentially generating some kind of positive energy is definitely appealing. After all, who doesn’t benefit from a little extra motivation? Now imagine applying that concept to food. That’s what Karma Kitchen does. 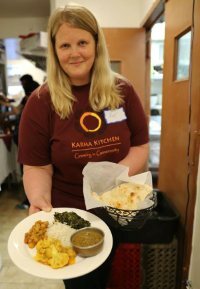 Described as a “a volunteer driven experiment in generosity,” Karma Kitchen explores the concept of the “gift economy” by offering its guests free meals (all you can eat, no less) once a month. That’s right. Free. Meals. Now it wouldn’t quite be karma if the meals were entirely free in the purest sense of the word because no one (other than the hosts) would be cultivating said positive energy. That’s why at the end of every meal, guests receive a check. That check reads $0.00 but invites those who have enjoyed the meal to leave a donation. That donation then works to cover the meal of another guest and, in that way, you pay it forward and generate good karma yourself. I had the pleasure of volunteering at the Karma Kitchen in Washington DC. It’s held the last Sunday of every month from 12-3pm at Himalayan Heritage in Adams Morgan. Volunteers work from 11am-4pm so I arrived at the designated time to learn the ins and outs of the program and to train. 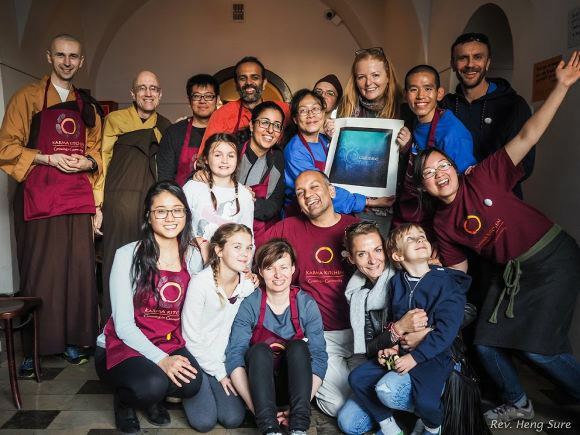 Training started out by sharing intentions and gratitudes which turned out to be a really nice way to ground ourselves in the mission of the day. Once we had gone around the table and introduced ourselves and shared our intentions, we got to the business of assigning roles for ourselves. Some folks were assigned to host while some folks were assigned to serve. I offered to volunteer in the kitchen plating food because I generally prefer to work behind the scenes (#introvert). 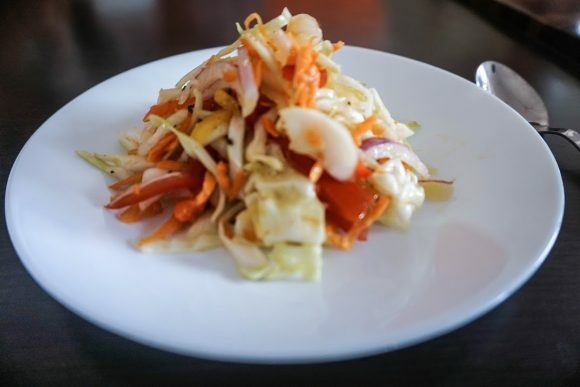 Though Karma Kitchen offers an all you can eat dining experience, the meal offerings are not left out for guests to serve themselves buffet style; rather, the food is plated and served by those working the dining room. So, each time I got a ticket I’d load up the plates in the kitchen and hand them off to my servers. I was curious about this particular decision so I decided to inquire about it once we had finished service. As I suspected, the logic behind this decision is in total alignment with the Buddhist philosophies embodied by Karma Kitchen. Karma Kitchen isn’t simply about the food. It’s about the experience. It’s about an interaction between individuals. By serving the food rather than asking guests to serve themselves, the food on the plate becomes a kind of offering, a kind of gift, and that is the essence of Karma Kitchen. I spent the bulk of the morning and early afternoon serving food behind the scenes but, as the day wore on and as our customers started to dwindle, I took a stroll out into the dining room to observe this “experiment” firsthand. I saw guests seated at a communal dining table not only sharing a meal but also sharing stories and sharing themselves. I heard the sound of laughter and I saw the exchange of homemade gifts (I still have the bracelet I was gifted by a Karma Kitchen customer). I saw a kind of comradery that you wouldn’t necessarily see in another environment or at another more conventional meal. The spirit in the air was one of generosity and positivity. Guests stayed well past the time they had filled their bellies. They stayed to fill their spirits. At the close of service, volunteers took a seat around the communal table where we shared our intentions and gratitudes once more — this time as a reflection on the experience. Guests has left behind comments and gratitudes themselves and we took some time to read those aloud, together. That in and of itself felt very much like a gift. 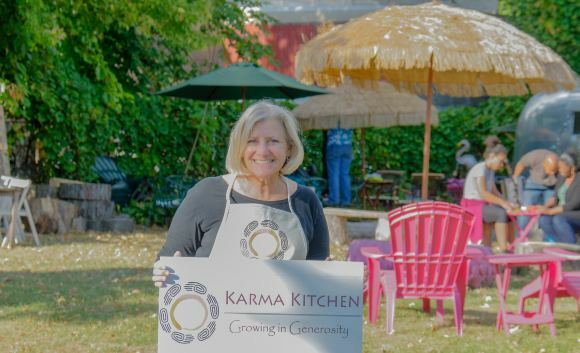 Karma Kitchen is now in its tenth year of operation. It exists not only in DC, but also in Chicago, Tokyo, Singapore, Delhi, London, Detroit and the list goes on and on. It does not, however, exist in Baltimore. I, for one, would like to bring it here because I firmly believe in the generosity of our community. Do you? Are you someone who would like to participate or volunteer? Are you someone in the industry who can offer up restaurant space once a month to engage in this social experiment in generosity. If you are, I’d like to meet you, I’d like to know you. Let’s chat over a cup of chai or a meal. Let’s start something together. Let’s generate some karma in the kitchen. Krishna Desar explained that the program aims to move people from transaction to trust, scarcity to abundance, and isolation to community. To encourage the transition toward building a community, guests are given the option to either sit at a larger community table where they can interact with others or take a seat at one of the personal tables. It was Friday morning. I was cooking a meal that would be served that evening at Karma Kitchen. The forecast for the evening was rain. 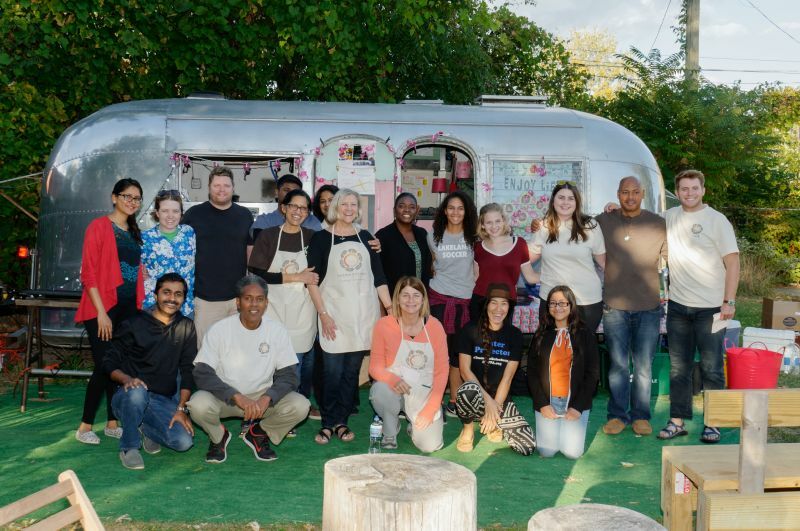 Karma Kitchen is an outdoor event with the food truck ‘Pink Flamingo’! But Somehow I was not worried! Deep in my heart I knew everything was going to be ok and left it to the universe! As we were arranging the tables and the vases with the flowers from our gardens it started getting cloudy. A few drops of rain began to fall. I was trying to just focus on what I was doing and not let the mind immediately rush to worrying about what steps to take next if it started pouring. Suddenly I hear Bharat Uncle's excited voice "Look up!" Up in the sky there was the most beautiful complete and clear rainbow!!!! The universe had gifted us with a colorful arch, a gate to welcome guests to our Karma Kitchen. What an amazing inauguration of our third Karma Kitchen in Detroit! The guests were super impressed by the beautiful ambiance :) as they walked on the rug of colorful fall leaves and warmth of the fire pit. The evening was simply perfect, colorful with love, laughter, generosity and hospitality! Questions about Karma kitchen intentions and Service Space were answered, stories were shared. Not to miss the amazing food. This time a young couple Manoj and Anu, who have been regularly attending Awakin sits, stepped up to prepare delicious dosa (rice-lentil crepes) which is pretty laborious work. Since Anu is 6 month pregnant, we did not want to add to her work. But Manoj was excited and pretty confident that they could serve about 60-70 people and sweetly insisted on doing it. They were super cute chefs feeding the guests with crispy yummy dosas with a special demo showing them how to do it. Towards the end when most of the guests were served it started raining heavily. Some still sat at their tables with their umbrellas enjoying the meal. As the rain stopped we thanked the guest for being so accommodating and parted with the love, peace, and smile cookies, origami cranes and other handmade gifts. It felt like the whole universe stepped in to make this Karma Kitchen event a memorable one! At 11AM, we opened the doors. Few tables immediately joined, and given that the restaurant was situated in one of the hippest areas of Krakow, we were ready for the steady stream of people through the day. Connie, Jasky, Robert, among others, were our superstar servers. The restaurant had three seating areas, including the popular outdoor tables. "Sunday in Krakow with this weather is unbelievable! You guys brought the good weather with you," Ela said with a big smile. At one table of three, a young woman told us, "Actually, I'm going through a really difficult time, financially. But today is the most I've ever paid for a meal. I've been so moved by all of you. I came here for a quick bite, but two hours later, I can't leave. We have to start Karma Kitchen in Lublin!" Everyone looked up to Sheetal, Audrey and Khushmita -- and they delivered in spades. In their vintage do-nothing ways, things just happened around them. Arthur's two super-cute daughters insisted on volunteering (they even joined the Awakin Circle previously! ), so Khush enrolled them as smile-pin taggers. And boy, did they melt hearts! Even folks who didn't end up coming into the restaurant would receive smile pins from these smiley kids -- and within 20 seconds, they would be hugging each other and taking photos together. 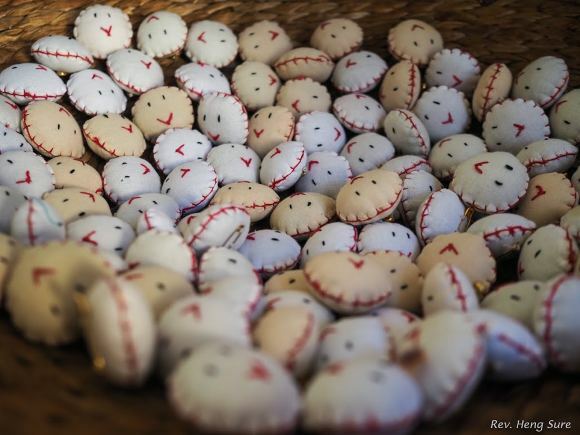 On one of the tables, a guest remarked, "In Poland, it's the norm to frown and complain. But it seems to be opposite here. Everyone is smiling and happy!" After their meals, everyone wrote something they were grateful for. And we saw notes like this one: "I was at Karma Kitchen. A lady named Khush told me I had a wonderful smile. I had not smiled much lately." So many tables were brimming with gratitude. One note on the gratitude wall read, "I am grateful for a beautiful meal in a beautiful restaurant in a beautiful city with the most beautiful girl I've ever met." Some felt it was referring to one of the servers, but it's still being debated. 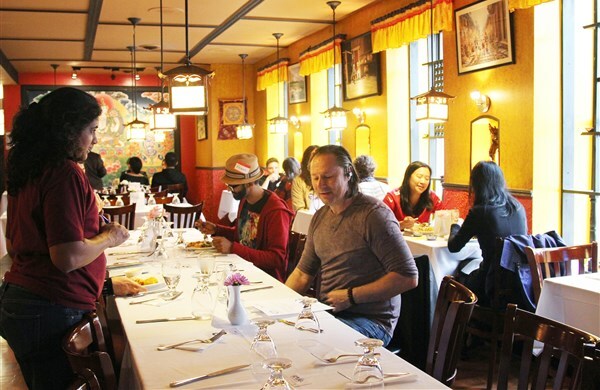 :) One table featured a Polish gentleman who spoke fluent Hindi, so we called out our Indian chef so they could converse and connect locally. Two New Karma Kitchens Launch! In Valencia, California, a new Karma Kitchen launched! Read the recap here. And on the other side of the world, in Hyderabad, India, volunteers piloted another KK as well. Seva Cafe Video Goes Viral! Imagine a Restaurant where there are no prices on the menu and where the check reads Rs.0 with only this footnote: "Your meal was a gift from someone who came before you. To keep the chain of gifts alive, we invite you to pay it forward for those dine after you." That's Seva Cafe, a experiment in 'peer to peer' generosity. At Seva Cafe, we serve with the spirit of "Atithi Devo Bhava" which translates to "The Guest is God," a deep and ancient Indian view that honors each guest with reverence. We're all used to the concept of offering a meal to family or a friend who visits our home, but at Seva Cafe, we extend this generosity to a stranger we don't even know. The guests are told we trust them to accept this gift and pay forward the generosity so that this experiment can continue. When you dine at Seva Cafe, you are not viewed as a customer, but instead as our treasured guest, as part of our family. Seva means service. When immersed in the heart of Seva, one finds a pathway to the Divine, and its this connectedness to which we ultimately aspire. 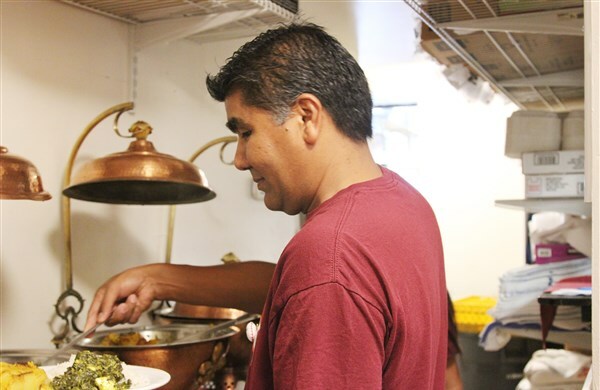 Volunteering at Seva Cafe is a conscious exercise in staying tuned to that deep and true space of genuine service. 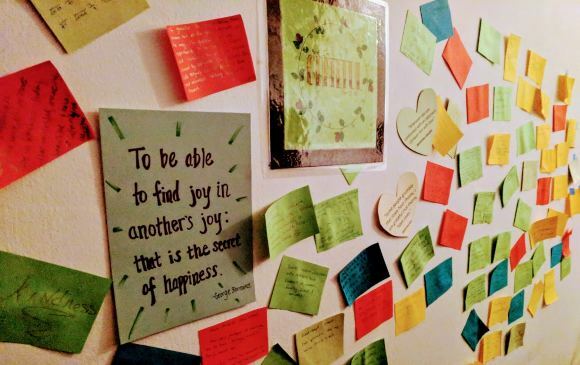 As more participate in the joy of giving, the more the experiment thrives. It begins with a single gift: first given, then received... multiplied, and given again, in a growing chain of kindness and care. We hope this Circle of Giving leaves you feeling more nourished, and inspired to carry the experiment forward. All costs and income are made transparent, and 100% of any profits are used to support social service projects..! After a hiatus, we just re-launched Karma Kitchen last weekend in DC! Aya, Kat and the local gang was excited. The week before, all the volunteers came together to settle the logistics, gathered up all the supplies and brainstormed ways to spread love. We knew that one of the founders of KK was going to be in town, but it was a very happy surprise to see Amit, Ashish and Manal also come down from New York! We opened the morning with a circle of sharing, in the orientation. A teenager shared a story of stopping to pray for deer killed on the road, another spoke about receiving a ride from a stranger, Kristin blew bubbles to spread cheer, past volunteers like Sateen recalled their experiences, another volunteer spoke about paying forward for a Subway sandwich the night before. Most of us were sporting our Karma Kitchen tees. The restaurant owners, for whom this was the first time hosting the restaurant, also joined us. 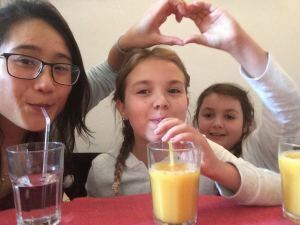 Aya, who has been a volunteer for dozens of Karma Kitchen, would later remark that the opening circle was a deeply transformative one for her -- and reconnected her to why she serves at KK! As the door opened, it was a great thrill. We served the trickle of guests coming in, got our logistics in gear, before the restaurant got buzzing. On the side was our makeshift kindness table -- from heart pins to Smile Cards to works & conversation to many small gifts. Each table had a unique quote, alongside a Karma Kitchen menu, and smiling volunteer servers. As guests left, we gave them all small plants to "plant seeds". In such a context, ripple effect is very natural. Conversations are different. A guest asked one of the volunteers, "Do you think this spirit can be applied to law?" That led to the story of a compassionate judge. Another guest was visiting from Los Angeles, and wants to start something there. Yet another started opening up his career transition, while another guest wondered about serving locally. Outside, bunch of volunteers were doling out free hugs on the streets while others were holding banner that read, "Honk if you believe in the power of love!" In the closing circle, there was a strong feeling of kinship. Even the restaurant manager and owner expressed deep gratitude. With that gratitude, we hope to continue the ripple every month. As for me, I was tagged with this small Hershey's kisses box, signed by Barack Obama. It was intended for my kids, but in the spirit of Karma Kitchen, I gave it to my friend's daughter -- who is terminally ill, cannot stand on her own, but is a huge fan of Obama. She was so happy to receive it, and so was I. Just like Karma Kitchen, in making others smile, we are left with a smile ourselves. A Micro-Moment Filled Karma Kitchen! What a gift to be at Karma Kitchen on the once-every-four-years day when February 28th is the second to last day of the month! From start to finsih, our circle of 14 volunteers quickly transformed into a humming team that collectively served 110 guests! With an enthused crowd streaming in at 11AM, we hit the ground running as Rezwan jumped right into his first table of nine guests! Mimi instantly embodied her "savior" role-- finding the missing forks and filling in all gaps with a never-fading smile! Jon kept all his tables beaming as he serendipitously ran into multiple acquaintances, as Eva and Brandon zigzagged the restaurant, clearing tables and delivering orders with Olympian agility! At any given moment, so many micro moments of care were transpiring before us. When a guest's cup of gratitude overflowed into a Rumi poem performance, Eva stepped-up the goodness by inviting our poetic performer to lead us in a "Happy Birthday" song for one young man who came with his parents. Shortly after, without skipping a beat, the birthday boy's mother nudged their elegant cake into my hands and said, "This is for all of you volunteers!" It made me think-- if I had walked into any regular restaurant, it would be highly unlikely that a random guest would instantly share her birthday cake with a bunch of strangers. But on this day, in this way, were were family. They had come at a peak hour, had never heard of Karma Kitchen, and the only seats available were at the corner of the Community Table. Yet something about the spirit in the air, and perhaps the intention to simply grow in generosity, with no strings attached, lit a spark in their eyes, and a down-to-earthness in their hearts that made it so easy to connect, so humbling to remember how we are all in this thing called life together, often in ways that don't meet the eye. Meanwhile, behind the counter, our interface Vishesh did everything (though he claims to have "done nothing"). And in the kitchen, Zeenia transformed the swirling stream of orders into love-in-action while Navina and Cathy poured endless goodwill into each plate that went out. Karen and Tiffany made art out of an assortment of delectable desserts (including one guest's offering of homemade cupcakes)! On top of it all, Jerry's dedicated attention to detail and Saourubh's can-do attitude invisibly grounded our whole team as their high-quality dishwashing kept us going strong! 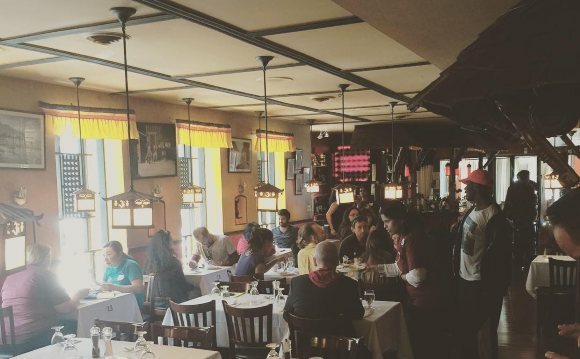 Even after our closing circle, everyone's collective energy made for an effortless clean-up that left the restaurant shining. As the last few pots were soaped and put through the sanitizer, one volunteer (who'd been our star dishwasher the whole day!) noted, "I should do this more at home." Me too, I thought. New Video, Research and 22 Locations! Karma Kitchen has now run in 22 locations around the globe, and mushroomed into many related experiments. In November, KK piloted in the UK and is set to repeat in London this month. Similarly, the second KK is about to happen in Dubai. In India, it continues to ripple into quite a few experiments. Detroit had powerful moments in their debut last year, and just a few weeks back, after a launch in Guernsey, a kindness movement is gripping the entire island. Renowned researchers are also taking note. We've always been speaking about the subtle but significant difference between pay-what-you-want and pay-forward, and here are some slides that summarize the scientific studies behind it. Many have asked about best practices in embodying these "gift ecology" principles, and that has led to a launch of a popular Laddership Circles program. It's a great joy to be part of this movement together, to collectively practice "growing in generosity". A Shining Septemer Karma Kitchen! Whether plating food, washing dishes, taking orders or simply offering a listening ear and presence -- it was incredible to witness the micro-moments of love that endlessly transpired as our rockstar crew smilingly served 67 guests from all walks of life-- vibrant artists and transformative lawyers, international students, down-to-earth teachers, inspired businessfolk, and beyond. In each moment, small acts of care enveloped us from all sides. One guest walked in with offerings of a handpicked bouquet, chocolates, and handmade stones. Two members of the community baked offerings of raspberry tart and chocolate chip cookies to add to our dessert menu -- simply to give in some way. 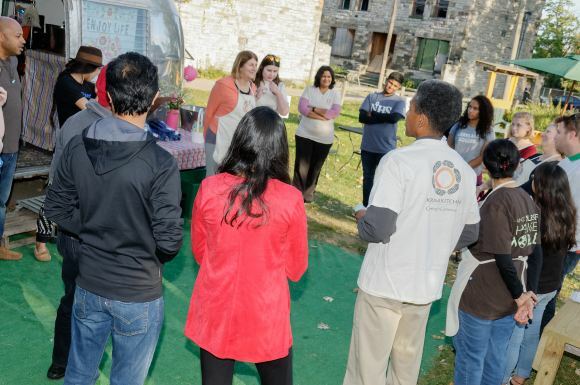 Our mostly first-time crew of volunteers stepped up the generosity in subtle and profound ways. With Xiao gently tagging folks with heart pins at every turn, Raku's depth of presence in conversing with each table, Ron's steady can-do spirit, Saina's swift setting of each table and filling in of any gap, Zilong's mastermind interfacing and delightful moon cake, Brenda's artistry both on paper and in each plate arranged with a glowing heart, Nina skyrocketing through the plating learning curve and thoughtfully making sure everyone ate, Ivina's mastery of "all the D's" - drinks, desserts, dal, and beyond :), Anna's superhuman dish-washing resilience, and Vishesh's kitchen guidance coupled with way of making dishes and people shine -- as one of us shared in the closing reflections, it was as if we were all atoms supporting the whole and filling in wherever necessary! Then, on top of the usual Karma Kitchen emergence, it was doubly grand to witness the depth of our ServiceSpace Community Table conversations, as well as to learn about some dynamic pay-it-forward research! And even after our closing circle, everyone's collective energy made for an effortless clean-up that left the restaurant sparkling! Here are more pictures of the day. If you have a Karma Kitchen story to share, please email us. We'd love to hear it, and spread the inspiration!